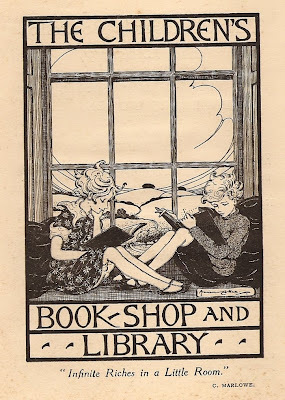 Above is a bookplate of extreme cuteness for a library probably long since dispersed. I like the quote from Kit Marlowe: 'Infinite riches in a little room.' The other quotation you see on bookplates of this period is Shakespeare's ".....find tonques in trees,/books in babbling brooks,/sermons in stone,/ and good in everything....." The background behind the two kids looks like the Cotwolds for some reason. More real than these two sonnenkinder are the four fine persons running a library sale in our pic below. 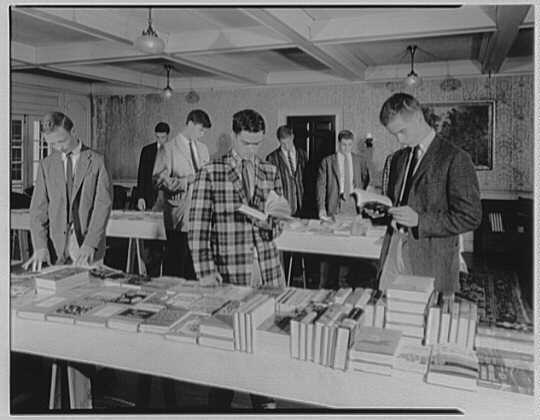 Library sale goers in California are apparently a pliant and unquestioning bunch, such marshalling would not work in Europe (with the possible exception of Germany) and in England it would lead to fights and possible hospitalization of some library staff and a handful of dealers. The thing about library sales is to have a plan. It helps to know what they have in there and info can sometimes be garnered in the line. You have to know where to head first and it is useful to have a mate or two so that you can be omni-present (divide spoils later.) In my experience they tend to make mistakes in the area of funny older novels, slim vols of poetry and funky or kitsch artbooks, photobooks, manuals and trashy paperbacks. They overrate Children's books, leather bound books, Americana etc., Many dealers scoop up anything that looks sellable and then go through it more carefully at leisure, possibly checking prices on Iphone devices or phoning a friend. This is slightly disapproved of but universal; even now libraries are probably working out ways of banning it. If possible avoid library books at library sales, you will see them priced up on the net but they look and feel unpleasant and with a few exceptions are slow to sell. 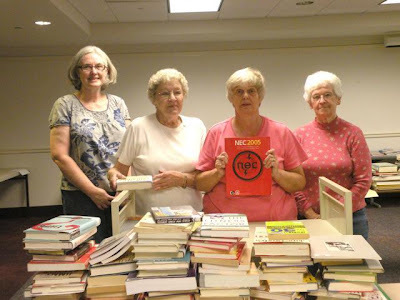 Most library sales are disposing of unwanted donations so library books are not so common. It is good to arrive with some sort of shopping bag or a capacious and slightly naff trolley bag. You cannot make deals and you cannot take stuff back. You will see 'civilians' (non dealers) buying tons of utter rubbish that they would never look at in a bookstore. Bargains are known-- a dealer in Berkeley who seldom pays more than a buck a book recently found the true 1908 first (it's green) of Anne of Green Gables at a library sale and turned it round for $10K. I found a proof copy of Hemingway's 'Fiesta' - so long ago that I cannot remember what I got for it. Just a quick comment to say how much I enjoy your blog and how true your comments are on library sales. 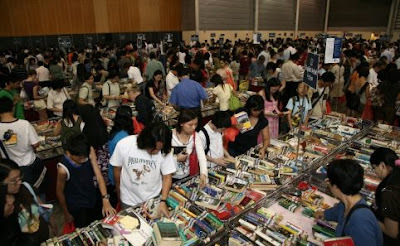 A similar phenomenon in Australia are the charity bookfairs, and the best ones are the Lifeline bookfairs. Here in Canberra Lifeline holds two fairs every year, in Autumn and Spring. I've been living in Canberra for 15 years and I haven't missed one yet. Over the years I've picked up some nice things - as you say, usually in the form of vintage paperbacks and older books, which they're a bit sniffy about. Gates open at 10am but I'm usually there just after 8am after dropping the kids off at school. Already, by that time, there are 100 people ahead of me, mostly dealers from Canberra and New South Wales. Apart from the main hall, in which about 150,000 books are sold on trellis tables, they have a rare book room, which opens at 12 midday. In recent years Lifeline has released a catalogue of the rare books - here is a link to the catalogue of the Spring Fair: http://www.act.lifeline.org.au/rarebooks.htm My eye fell on Wilkie Collins' Poor Miss Finch - not one of his better novels, but still the Bentley triple-decker 1st, 1872 - and the price was $30. Ray Russell prices it as 750 quid in his guide, and Richard Dalby in the B&MC said 800-1000 quid back in 2005. 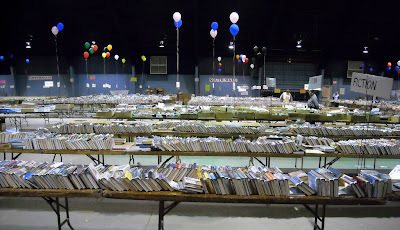 So, I lined up for the usual two hours, looked around the main hall for an hour (nothing really good - back in February someone had donated their science fiction collection, built up over 50 years, so I landed a couple of hundred 1950s and '60s paperbacks), and then joined the queue for the rare book room. Already there were 20 people in front of me and I thought I was stuffed. Fortunately, they had other books on their minds - the children's books and the Australiana. I made a bee-line for the lit section, and after some frantic searching found Poor Miss Finch. That was me for the day and happily retreated home to look at my pickings. But there is a postscript - when I got home I opened opened up the title page. At the top was the signature, "Wilkie Collins February 1872". A Google search revealed that this was Collins' own copy of the novel, sold at an auction of his library in 1890. Not a bad purchase for $30. Not in the same class for rarities, perhaps, but Amnesty International regularly have £1 books ales (going down to 50p towards the end) ar Conway Hall in London. They attract quite a few dealers as well as members of the public. Singapore is hot any time, Nigel. It has two seasons: hot and wet and hotter and wetter. hi from a former california library sale goer! I have done Palo Alto twice and last week did the biggest in San Francisco. These sales are a waste of time compared to other sources. 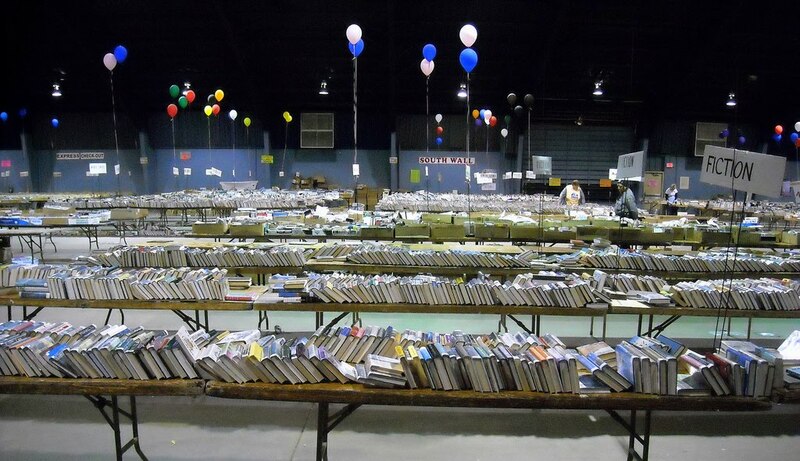 The donators and organizers are hip to the resale value of books and you are unlikely to find things that haven't been checked and re-checked. To keep people coming, they will leave crumbs worth up to a certain amount (say $20) but the margins are poor when they are pricing up to $5 a book and you factor in the time it takes to sort through junk. The big sales are best suited for hobbyists and sellers with scanners who want to churn large amounts at low profits- or sellers who think they might get lucky from "mistakes". Rule of thumb, when it's well publicised around here it's not worth going. There are other ways to do well, you just have to be crafty. I have found the following American booksale site most useful.